Guitars, Tim Bob - Bass, and Brad Wilk - Drums. Contains tracks: The Ghost of Tom Joad, Vietnow, People of the Sun, Bulls on Parade, Bullet in the Head, Zapata's Blood, Know Your Enemy, Tire Me, Killing in the Name. Uncensored video clips of: Killing in the Name, Bullet in the Head, Freedom, Bulls on Parade, Memory of the Dead (Land or Liberty) and People of the Sun. Total Running Time: Approx. 70 min. The video anthology includes thrilling concert footage, non-album songs, and full-length, uncensored versions of Rage's controversial music videos. In addition, the home video comes with a bonus CD single - a new Rage studio recording of Bruce Springsteen's "The Ghost of Tom Joad" - and a bonus video performance from the 1994 Pink Pop Festival. 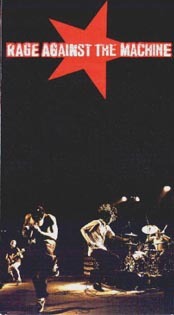 "At the end of the 1997 US tour," says guitarist Tom Morello of Rage Against The Machine, "we looked back and realized that we had a vault filled with great live foot-age as well as some pretty amazing videos never shown uncensored in the United States. We took the best of that material, added some spicy bits, and put together what we think is a pretty good representation of both our live shows of the past three years and our overall vision." "Vietnow" and the non-album track "The Ghost of Tom Joad," produced and di-rected by Heather Parry. Filmed during Rage's September, 1997 performances in Irvine, California. "'Tom Joad' is a song that's so fresh for us, and these performances sort of sum up the '97 tour." "People Of The Sun," "Bulls On Parade," "Bullet In The Head," and the non-album track "Zapata's Blood," filmed for MTV/Europe's "Live 'N' Direct" series at Rage's 1996 performance before an audience of over 50,000 at the Rock Am Ring Festival in Germany. "The European festivals were so amazing just to watch from the stage. These songs were filmed in a very punk-rock verité style  our Altamont, if you will." "Know Your Enemy," "Bombtrack," and "Tire Me," directed by Richard Leyland and produced by Geoff Foulkes. Filmed at the 1996 Reading Festival in England. "One of my favorite Rage shows of all time, which I played with a 102º fever. There was a level of intimacy, comparable to the best club gigs, between our band and 60,000 people." "Killing In The Name," live at the 1994 Pink Pop Festival in the Netherlands. "We were still playing clubs in the US, and here's a field of 60,000 kids going crazy for this song." "Killing In The Name" (uncensored version), directed and produced by Peter Gideon. "Peter was a guitar student of mine who had a video camera. He filmed two L.A. shows, at the Whisky and Club With No Name, and put this together. It was a great introduction to Rage, though it couldn't be shown on US television because of the non-PG lyrics." "Bullet In The Head," a video created by Britain's BBC and never aired on MTV in the US. "The tour bus pulled up in front of the BBC studio, we ran through the song once in front of the cameras, then left to play a club that night. "Freedom," "Bulls On Parade," and "People Of The Sun" (uncensored version). These videos directed by Peter Christopherson and produced by Fiz Oliver for Squeak Pictures Inc.
"Memory Of The Dead (Land And Liberty)," a previously unreleased spoken-word performance by Zack de la Rocha of Rage Against the Machine. Zack's voice is heard over a motage of scenes from Sergei Eisenstein's 1931 documentary Qué Viva Mexico (a/k/a Time In The Sun) and contemporary footage from the Zapatista rebellion in Chiapas, Mexico. CD single with one song "The Ghost of Tom Joad" covered from the Bruce Springsteen song. The lyrics to this song were almost exlusively derived from the John Steinbeck book, "The Grapes of Wrath". In fact, the entire last verse is taken directly from the book.